Our half vision frameless glass to glass half vision case provides a seamless view at an unbeatable price. All of the glass is tempered, making it safe. The interior shelves in this frameless half vision case are fixed. Frameless cases work well in aisle areas or against a wall. 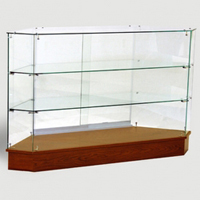 The tiered design of this wall display case helps save valuable retail space without sacrificing display space. The simple design does not distract customers and keeps the focus on your products. This wooden glass wall case is constructed of solid wood materials. This gives the wall case much more durability to last in a retail environment. A frameless upper and hinged storage gives this economy full vision tower a good mix between merchandising and storage. The glass is all tempered. Both lights and locks are available on the frameless tower display portion. Lighting is no issue with this black hexagon display case due to its standard 50 watt halogen light. It also has a mirror deck to help reflect this light into the case making your products easy to see. Melamine laminate surface is very durable and easy to clean. 4"H Drawer w/ Metal Slider. Adjustable interior shelf to accommodate different sized items. This tower display case is constructed in a circle. It measures 22"w x 22"d x 76"h and is available in all standard finishes. Custom finishes are available upon request at an additional cost. 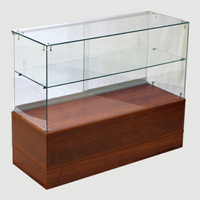 Store collectibles or merchandise valuables out of this lighted glass display cabinet. The interior shelves are tempered and are adjustable so you can fit the display cabinet to your product. The cabinet stands at 75" H and is made of real wood. A variety of stains are avaiable. We can also match stains to something in your current decor if you need us to. 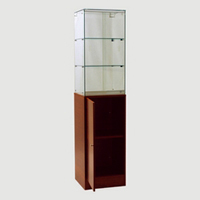 This corner showcase is designed to fit with other frameless showcases in order to make an "L" in a showcase run. Keep in mind, this is what is known as an outside corner. This corner glass showcase is accessible from the small side of the corner. As with the other frameless showcases, the shelves are fixed and full depth.